Everyone’s talking about the rain. We’re talking Filson. It may look conservative, but think Wellies, walking through muddy fields. Hip, no? Splurge on the durable jacket. They’ve been around for more than 100 years and this stuff is made to last a lifetime. Removable adjustable hood. Contoured seams on front and back. Fully sealed seams. Double front pleated pockets with snap tabs. Side secure zipper hand pockets and one interior zipper pocket. Adjustable cuffs with brass snaps. Hem and back waist drawcord. 86% polyester with 8-oz. 14% wool and twill layer. 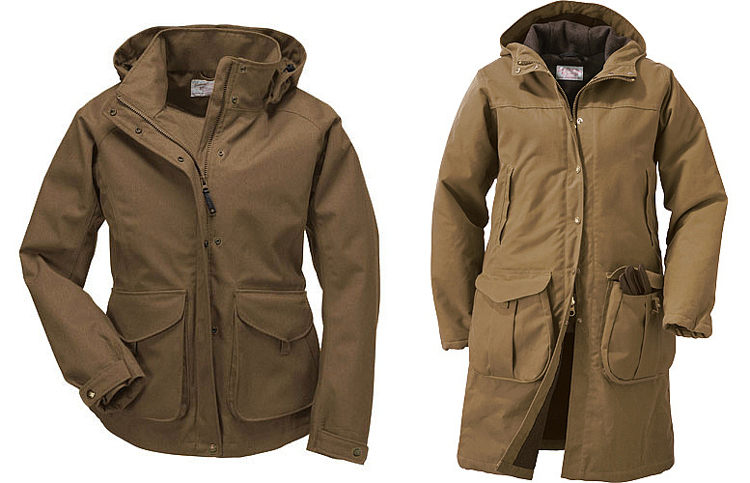 Water repellent and wind resistant oil finish outer shell. Inner wool lining. Insulated nylon sleeves. Integrated hood and storm flap front zipper closure with brass snaps. Lower bellows pockets with one handed loop openers. Upper handwarmer pockets. 8.5-oz. 100% cotton oil finish Shelter Cloth with 100% virgin Mackinaw wool lined body.